Prices do not include bike rental. Bike rental for Self Guided Trip participant is $30/day. If you bring you own bike, it must be a dealer quality mountain bike, in good operating condition. On this self guided adventure you bike heavily wooded back trails experience fantastic vistas. Overnight in B & Bs, Tall Pines yurt and Inns along the trail. Includes lodging, car shuttle, breakfast and trail lunch. Let your imagination run and we will work with you to design a trip to fit your interests and abilities. Possibilities include adding rock climbing, hiking or kayaking to your biking trip. Overnight lodging is scheduled at the locations listed below. We arrange your lodging based upon your interest, abilities and the availability of accommodations for the time your trip is scheduled. 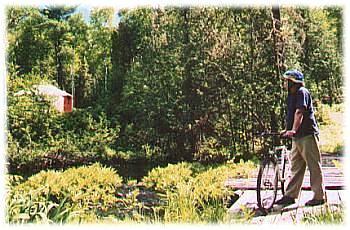 All accommodations are along biking trails. Distances vary between locations. Bed and Breakfast rooms with private baths. One with double whirlpool. One with double shower. Fireplace in Guesthouse. Deck. Full breakfasts. Suite with kitchen, fireplace and deck. Bed & Breakfast guest rooms with private bath in historic log lodge. Fireplace in lodge. Sauna on premises. Round canvas structure; equipped with gas lights, cook stove, wood heat and kitchen. Sauna. Canoe. Three miles from Grand Marais. Secluded B & B on forested ridge 1000 feet above Lake Superior. Private baths; sauna.